In the first half of the twenty-first century, giving to family and community foundations alone will be ten times in today's dollars what it was throughout the entire twentieth century. Yet despite tremendous innovation in the social sector, philanthropy's natural state is under-performance. Not since Andrew Carnegie wrote The Gospel of Wealth has a book been written that provides practical guidance for donors to get the most impact from their giving. Almost a decade ago, Thomas J. Tierney left Bain & Company to co-found The Bridgespan Group, a nonprofit focused on helping donors and nonprofit leaders to develop and execute strategies to accelerate social change. 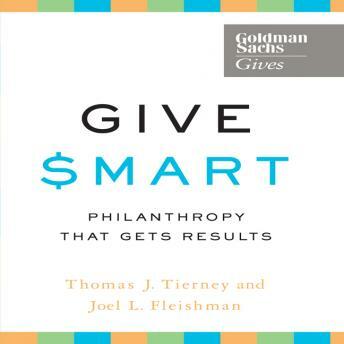 In Give Smart, Tierney pools his hands-on knowledge with philanthropy expert Joel L. Fleishman to create a much-needed primer for philanthropists and the nonprofit organizations they support. Drawing from personal experiences, testimonials, and Bridgespan's case studies, including those of the Bill and Melinda Gates Foundation and the John D. and Catherine T. MacArthur Foundation, Give Smart picks up where Jim Collins' Good to Great and the Social Sectors left off and presents the first in-depth, expert guide for engaged donors and nonprofit leaders.